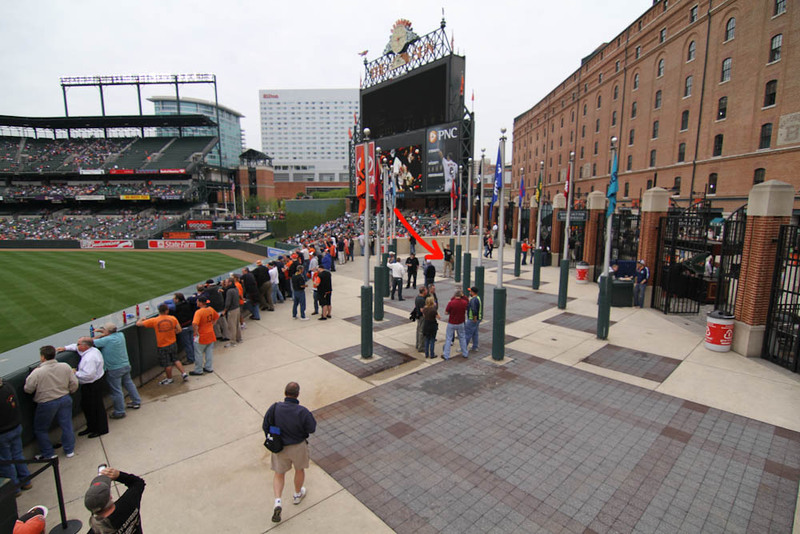 Several years ago, when MLBlogs switched over to WordPress, a bunch of my blog entries were lost, including this one — a 2,600-word account of my first time snagging two home runs during one game. Thankfully I had saved all the photos, along with the text from my original entry, so this was fairly easy to recreate. Enjoy! 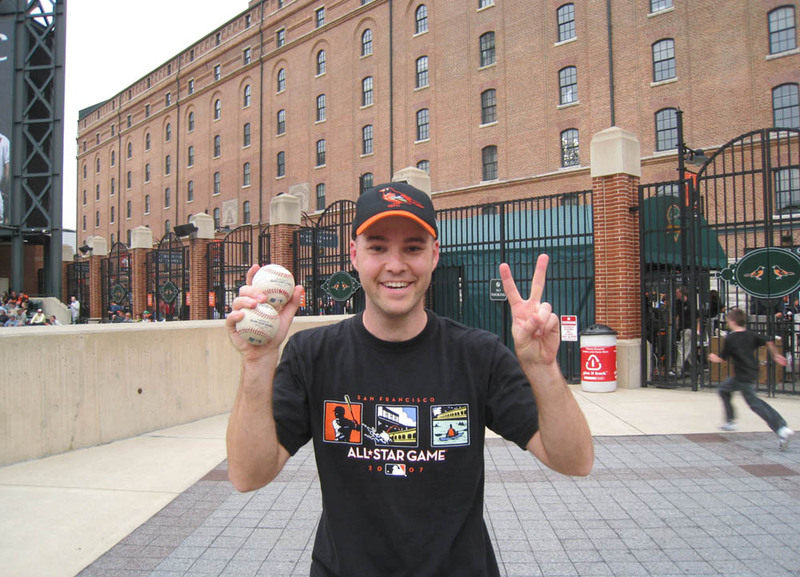 This was my third and final game in Baltimore. The rain had finally stopped. There was finally going to be batting practice . . . right? 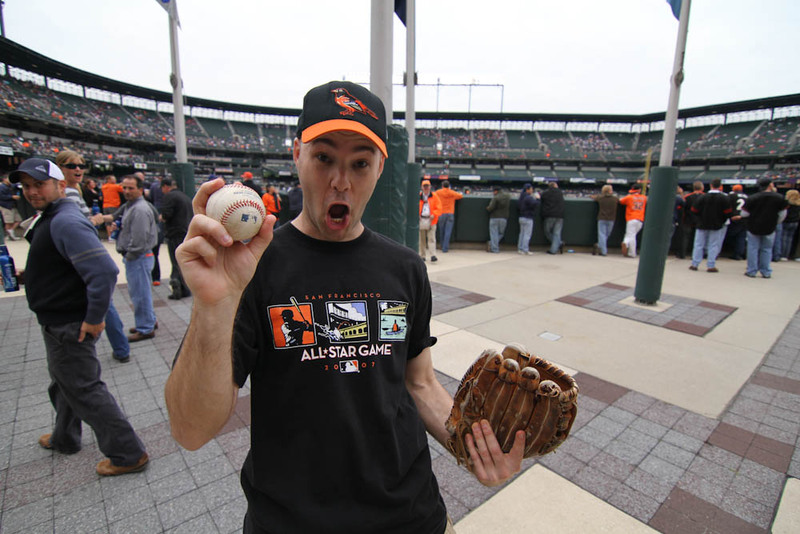 It was “Weather Education Day” at Camden Yards. 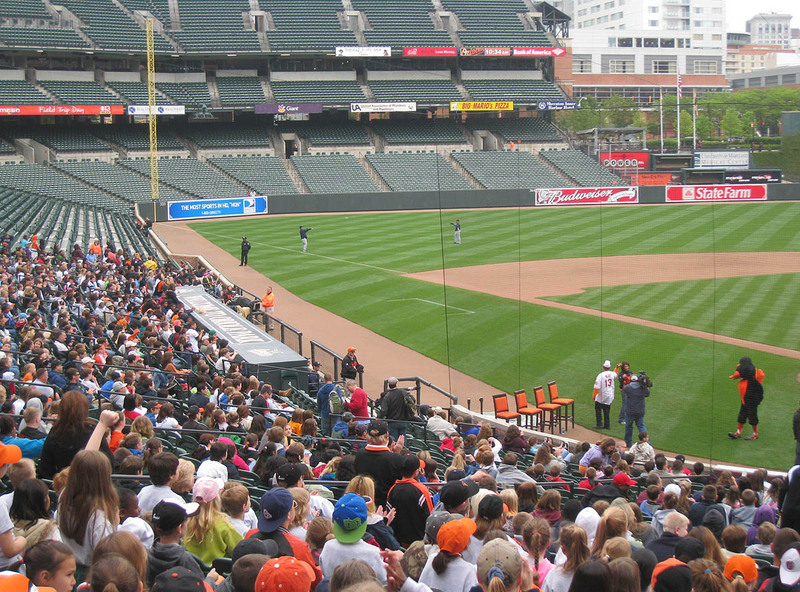 There were thousands of schoolchildren in the stands — and no players in sight. Unbelievable. 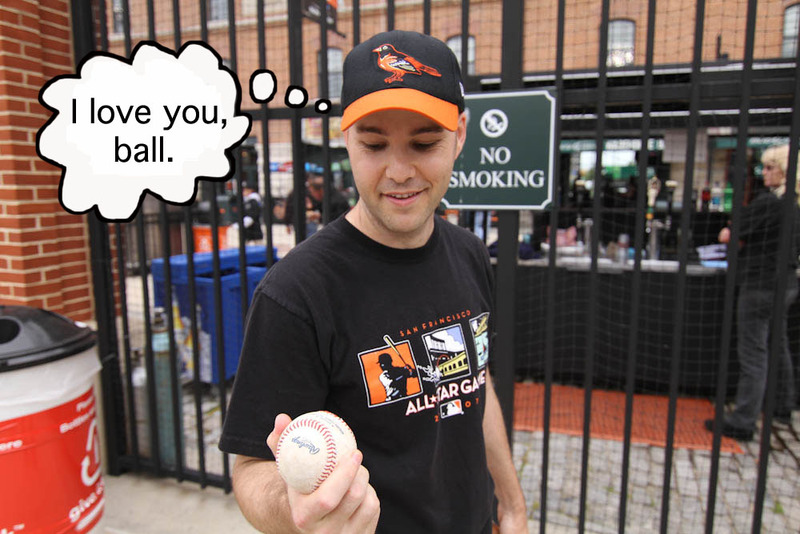 Three days in Baltimore. No batting practice. Several minutes later, two Mariners started playing catch in left field . . . In the photo above (which was taken by my friend Brandon), you can see a weather balloon in the background. Thrillsville. One of the two players was Ian Snell. 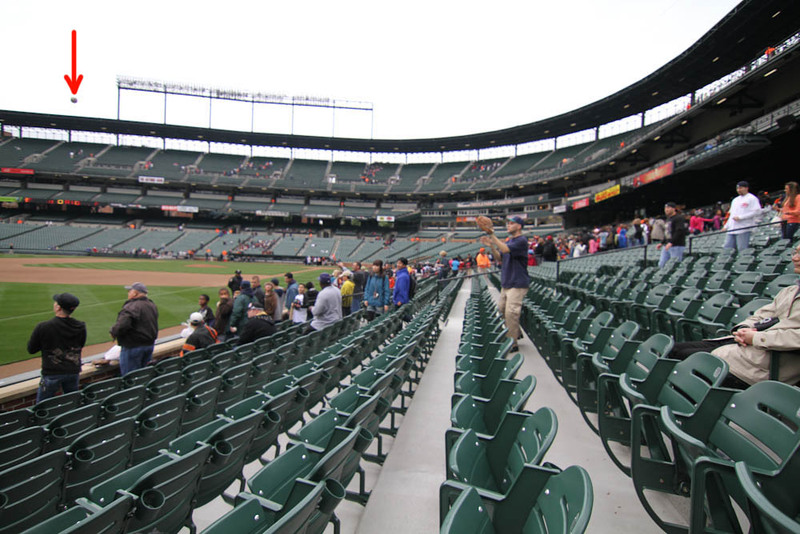 When he finished warming up, he threw (and I mean THREW) the ball into the seats in left-center. 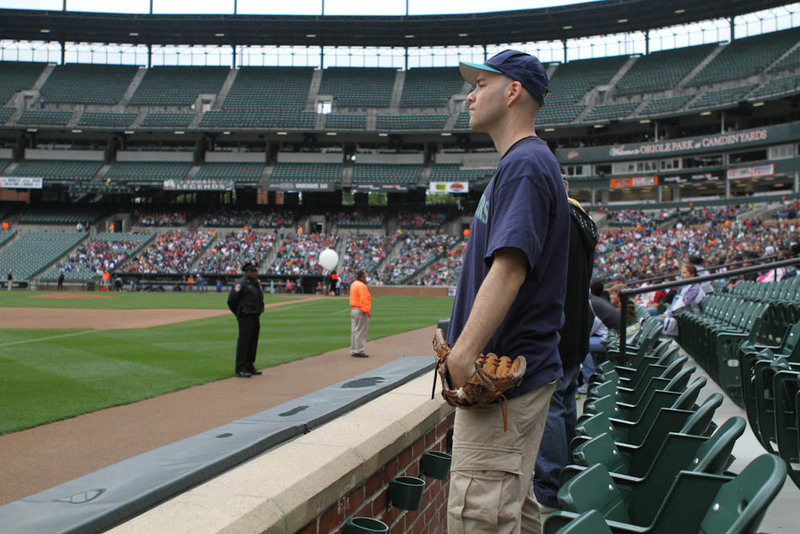 He probably fired it 250 feet, and when I realized that there weren’t any fans out there — that he had randomly chucked the ball into an empty section — I ran over to look for it. A fellow ballhawk named Matt also ran out. It was an all-out race, and we pretty much arrived at the spot simultaneously. For a split-second, we were both looking around frantically for the ball, and I happened to see it first. 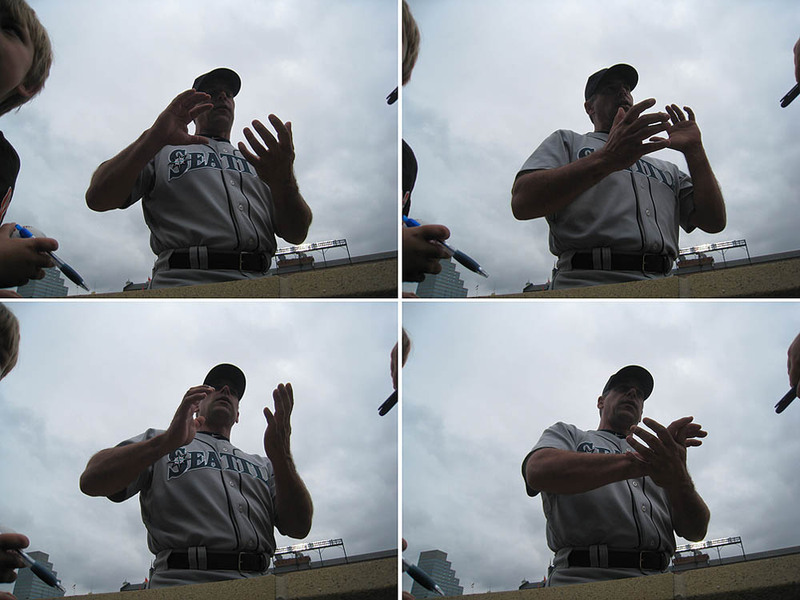 Bullpen coach (and former World Series MVP) John Wetteland started signing autographs. Here I am getting him on Brandon’s ticket . . . I don’t know what else to say about this. I just felt the need to report it, so let’s move on. I was stunned for a couple seconds until I realized that he was just messing with me. There were, in fact, lots of kids, so he handed the ball to one of them, and before he ran off, he flashed a big smile and gave me a fist bump. Brandon took a photo of me and Matt . . . The starting lineups were announced. Ken Griffey Jr. wasn’t playing. Again. Why did I even take this stupid trip in the first place? I just wanted to go home and get back to work on my book. I actually considered leaving. That’s how frustrated I was. But no, on second thought, that seemed silly so I stuck around, almost more as a formality than anything else. This was Brandon’s view during the game . . . 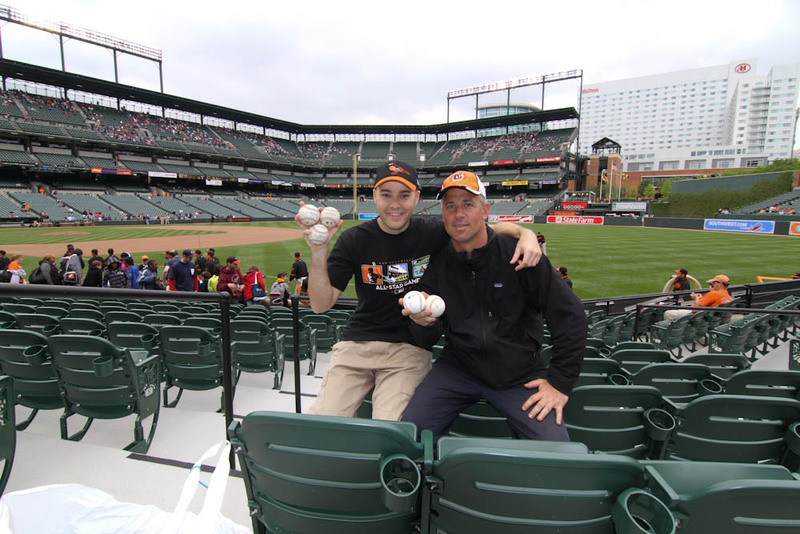 It was a great foul ball spot, but nothing came my way. At the start of the seventh inning, I was behind home plate when Josh Wilson, a right-handed batter, lined out to the shortstop. Rob Johnson, another righty, followed with a groundout to 3rd base, and as soon as he hit the ball, I took off for the standing-room area. 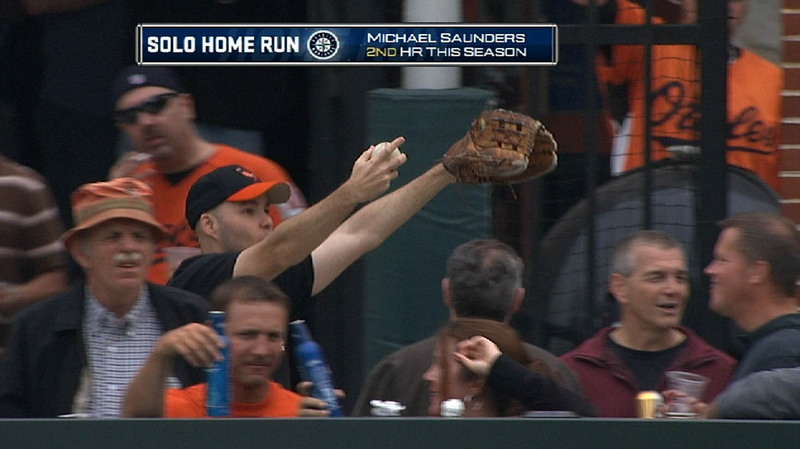 Michael Saunders, a power-hitting lefty, was due to bat next, and I needed as much time as possible to get out there. 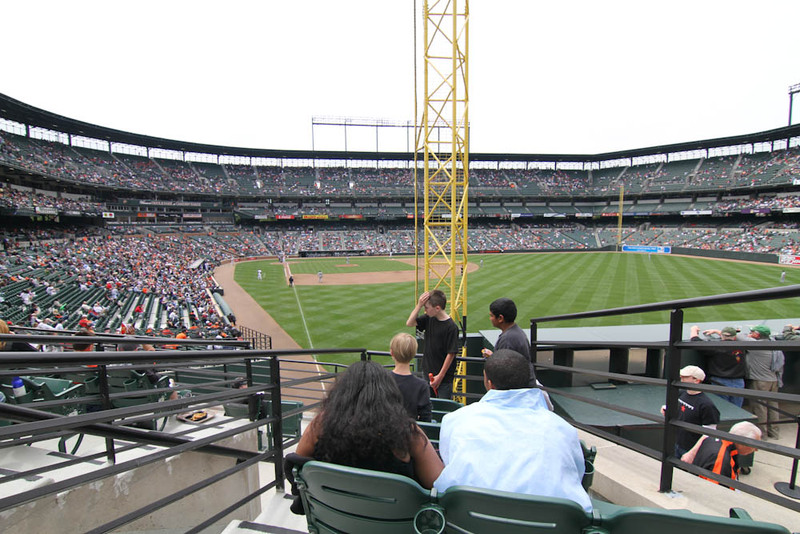 As I headed through the cross-aisle toward the foul pole, Saunders took ball one. I thought about running up into the seats to leave my backpack with Brandon (I had to carry it briefly when he left to get food), but decided to hang onto it. 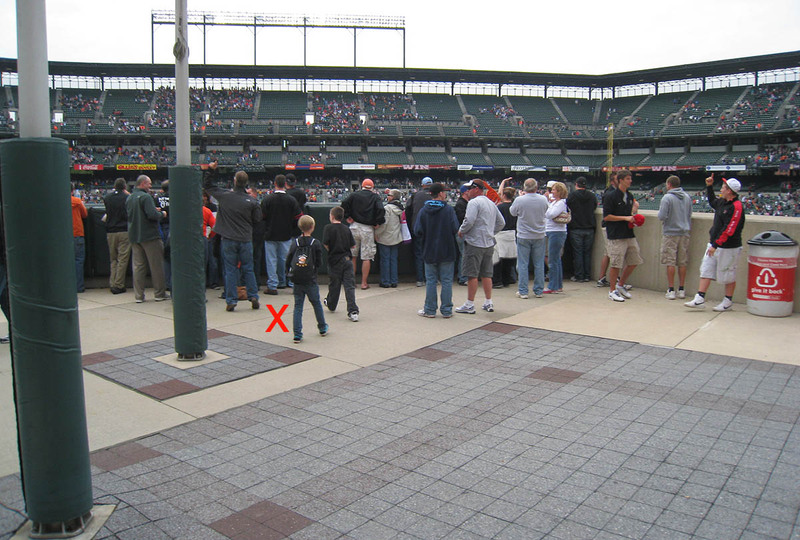 I remember thinking that with my recent bad luck, a brief detour would probably cost me a home run ball, so I kept jogging through the aisle and heading straight to where I needed to be. The count was now 2-0 — Kevin Millwood was working fast — and by the time I settled into my normal spot, Saunders had fouled off a pitch. As I ran over to show the ball to Brandon, everyone around me started chanting, “Throw it back!! Throw it back! !” and then another chant of “Give it to the kid! !” broke out. Kid? What kid? There weren’t any kids, and even if there were, too bad. 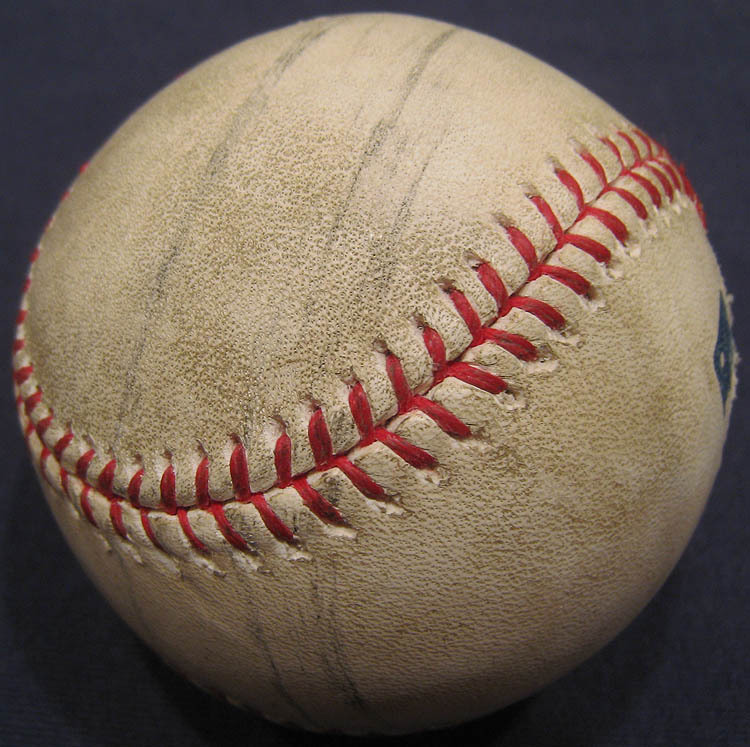 This was a game home run ball, and I was keeping it. Period. “Throw it back or give it to a kid!! !” shouted a nearby fan. Oh…you mean THAT kid? The little kid with a glove who was sitting in foul territory 100 feet away from me when I grabbed the ball? I doubt anyone had any idea what I was talking about, but at least they all got quiet after that. Then they watched closely as I reached into my backpack and pulled out another ball, and when I handed it to the kid, everyone started cheering wildly. What a bunch of fools. 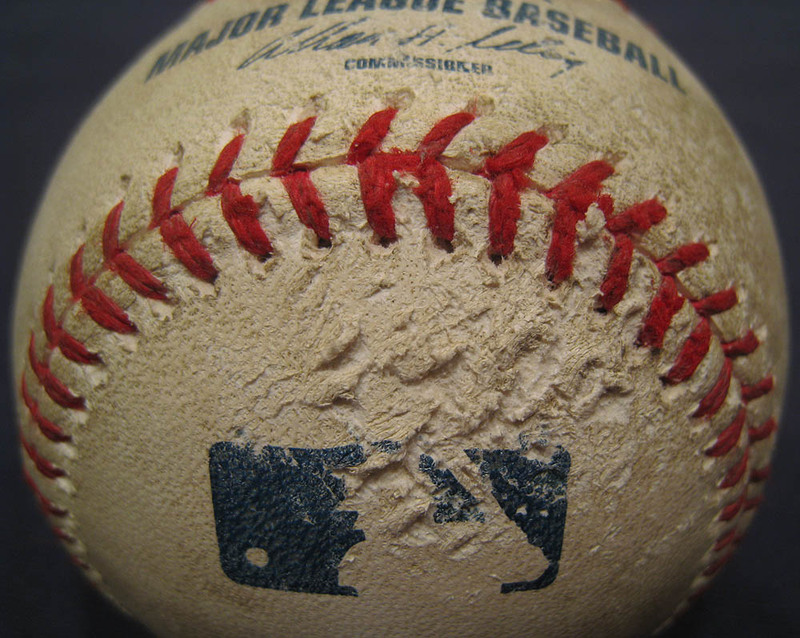 My guess is that the streaks were caused by the netting. 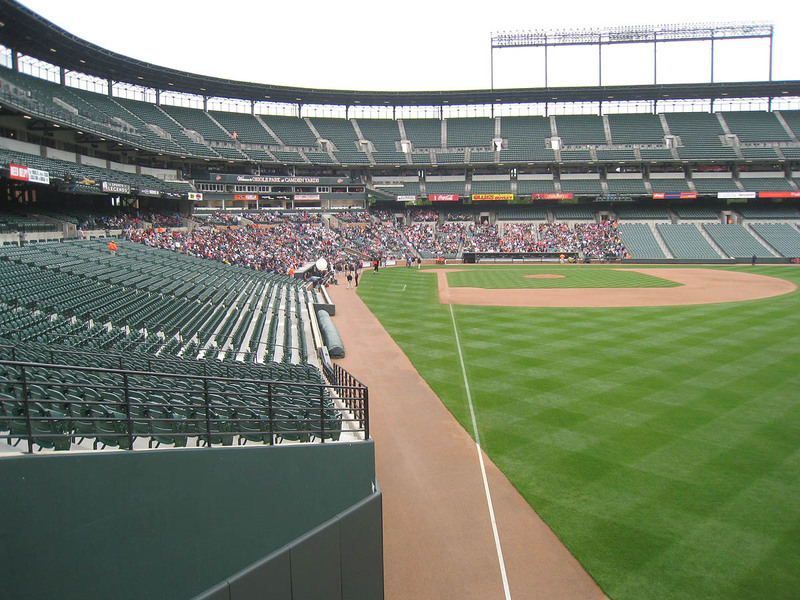 Brandon left the stadium soon after that. He had to get to the airport to catch a flight back home to San Diego, so we said a quick goodbye, and then I got back to business. 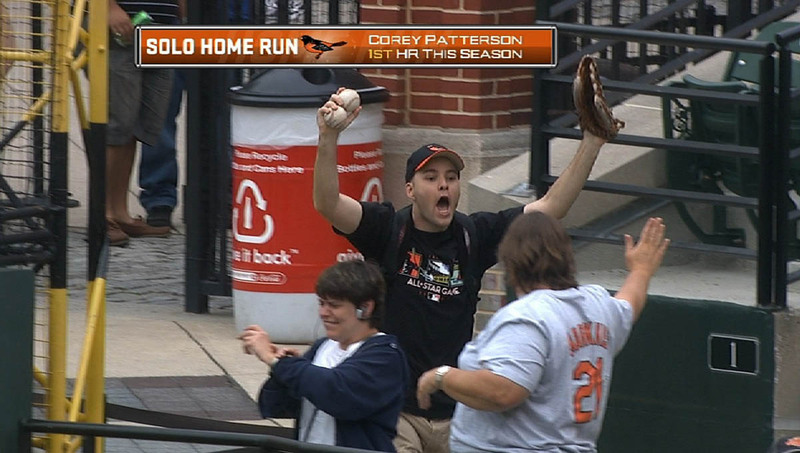 Snagging another home run, of course. 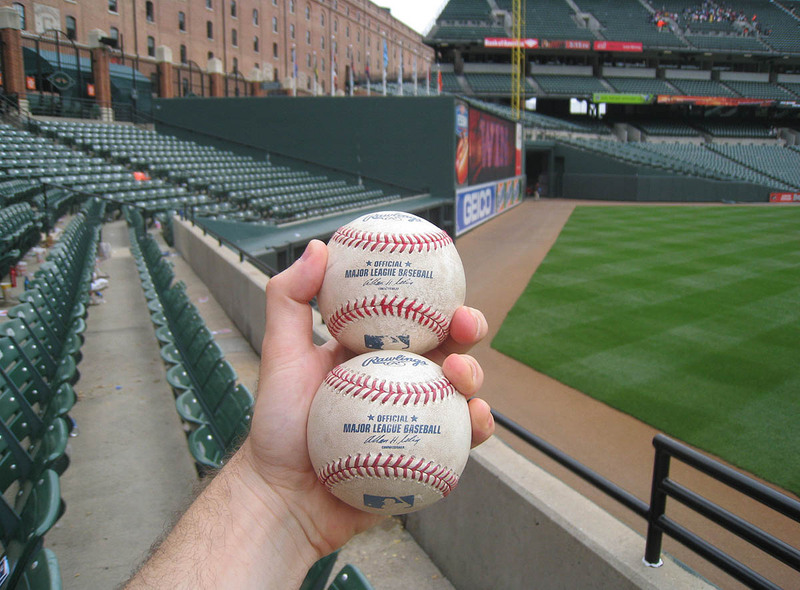 On three separate occasions, I’d snagged three foul balls in one game, but I’d never gotten multiple homers. There was no “give it to the kid” chant. Instead everyone kept coming up and congratulating me and asking if they could touch the baseballs and take pics with me. It’s too bad that Brandon had left because it would’ve been nice to have him there documenting it. 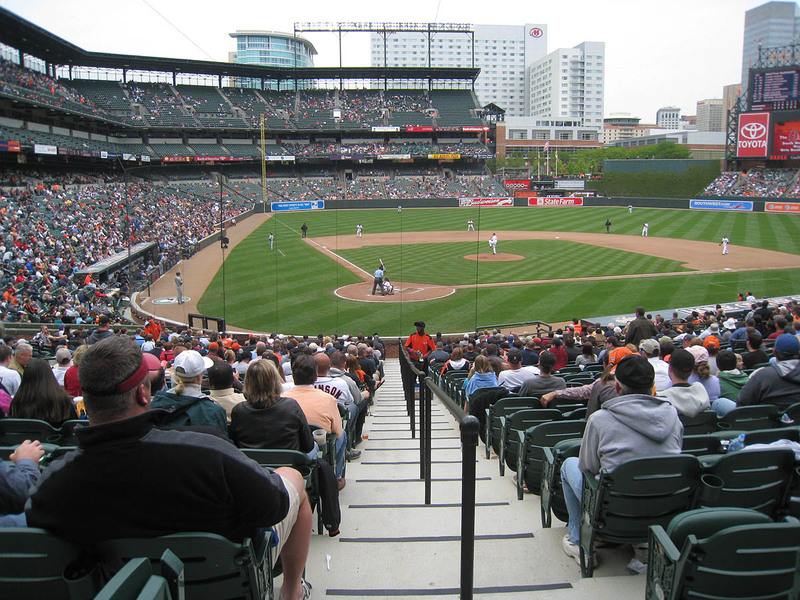 Five batters later, with the Orioles trailing, 5-2, Luke Scott came up to bat with the bases loaded. I was in the zone. I was focused and ready for another ball to fly my way when two attractive 30-something-year-old women walked over to me. “What’s your name?” asked the other. “That’s not gonna happen,” I said, keeping my eyes fixed straight ahead on where I needed to be looking. That did the trick. 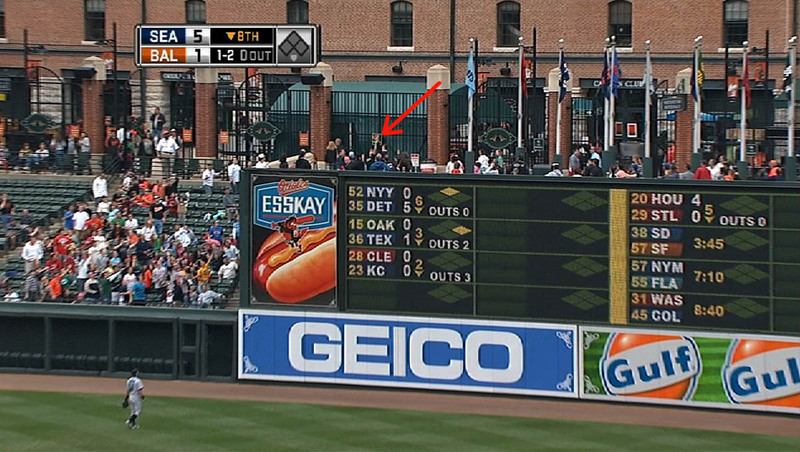 And then Luke Scott hit a grand slam — to left-center field, unfortunately. (I hate being rude to people, but in this case, I really had no choice.) Other fans were still coming up and talking to me, and in a word, it was chaotic. I’m not even sure if I would’ve been able to catch another ball if one came out, but I never got that chance. The game ended on a play at the plate. 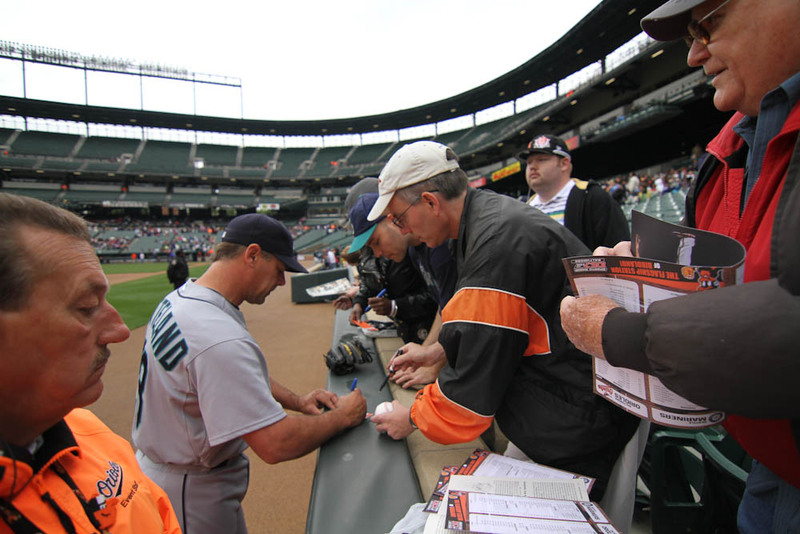 Ichiro singled, Josh Wilson was on second, and Corey Patterson (who else?) gunned him down with a beautiful throw from left field. Final score: Orioles 6, Mariners 5. Man, what a day. The trip turned out to be pretty good after all. Speaking of Pitch In For Baseball, you’re aware of the recent flooding in Tennessee and other areas in the south, right? 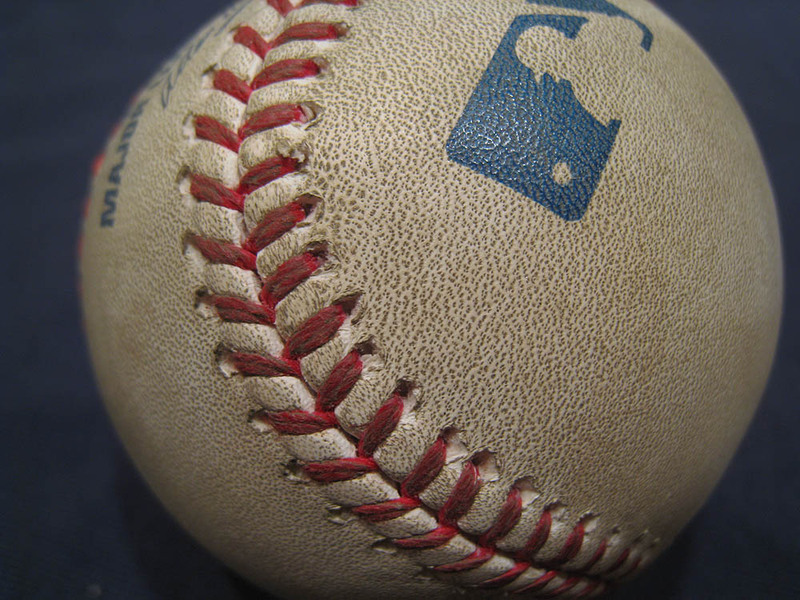 Well, among countless other things, the water destroyed a large supply of baseball equipment that was being used by Major League Baseball’s RBI Program. 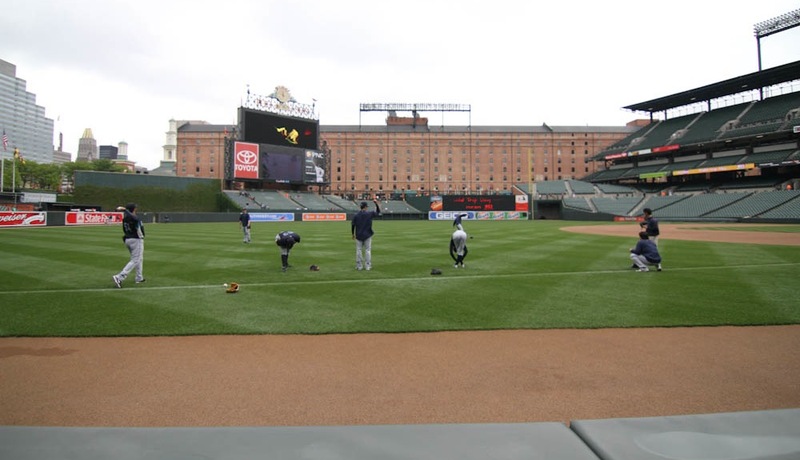 (RBI stands for “Reviving Baseball in the Inner cities.”) Because of all the donations that Pitch In For Baseball has been receiving, it was able to replace all the equipment and get the kids back out onto the fields. This is the charity that I’ve been supporting for the last two years. It does amazing things for kids and for the game of baseball. I want to thank everyone who has donated money, and for those of you who haven’t, I hope you’ll consider giving something, or at least spread the word. Even if you simply tell a few friends about it, that would help. Click here to learn more about what I’m doing for this charity and about how you can get involved. yes first comment,TC checkin in.,Arizona is tomorrow hopefully.good job with the two homers. I go to Flushing High School, which high school did you go Zack? Thrillsville lol. How exciting to have this documented! So how many more of those “lost entries” do you have? 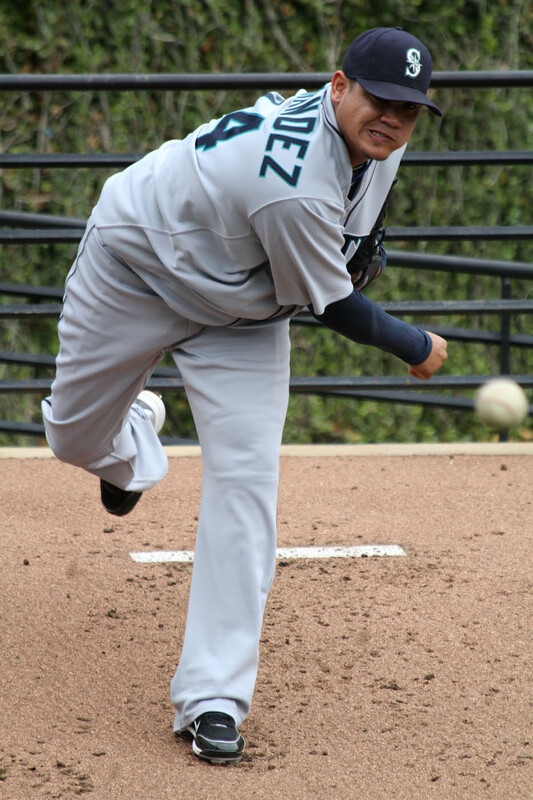 An awesome photo of Felix!!!! Thrillsville. Thanks. I’m jealous of your warm weather. Keep going to games. You’ll catch one eventually. I went to Columbia Prep, unfortunately. I don’t know . . . maybe a dozen? There are some non-game entries that’ve gone missing, including “Behind The Scenes at The Tonight Show.” That’s when I was on with Jay Leno, and it kills me not to have it online anymore. Hey Zack, I Love reading your blog!! Was wondering about how many autographs you’ve gotten from MLBers. 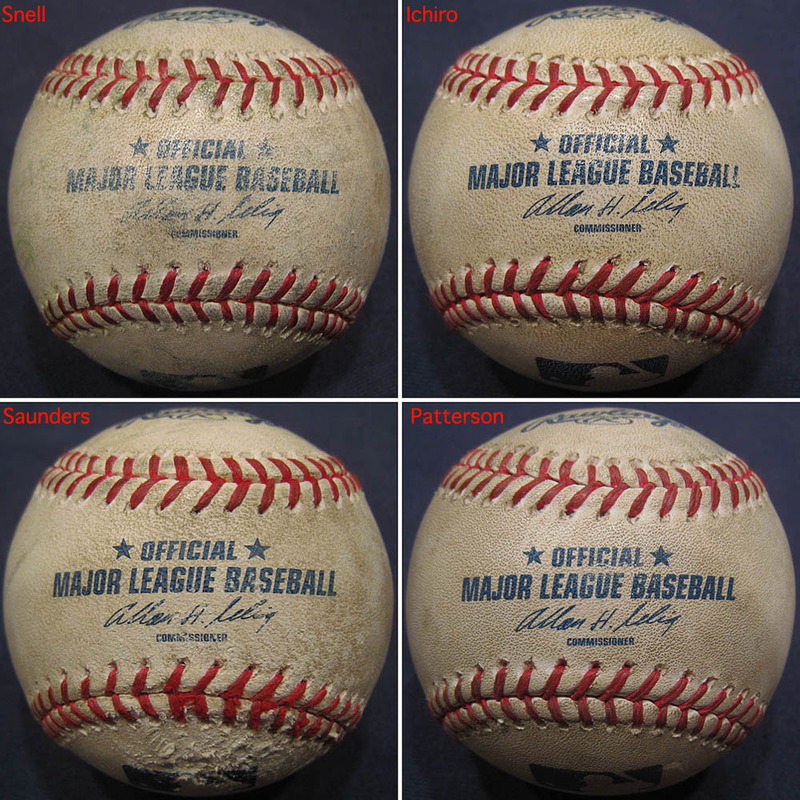 I think I’ve gotten 13 career MLB balls including an Adrian Beltre HR ball! Just sharing because I think what you do is really cool! I don’t know the exact number, but probably around 1,500 autographs. Thanks for checking out my blog!